COMMEMORATING THE fourth STANLEY CUP IN PITTSBURGH PENGUINS FRANCHISE HISTORY. ​The Pittsburgh Penguins were eliminated in five games in first round of the 2015 Stanley Cup Playoffs by the New York Rangers losing four games by a 2-1 scored including the final two games of the series in overtime. The Rangers' speed simply was too much for the Penguins and General Manager Jim Rutherford adjusted his roster accordingly in the offseason. He acquired Phil Kessel from the Toronto Maple Leafs via trade and sent Brandon Sutter to Vancouver in exchange for Nick Bonino. ​The Penguins acquired defenseman Trevor Daley from Chicago in exchange for Rob Scuderi on December 14th and lost their first four games under Sullivan by a combined 15-4 score including a 3-0 shutout loss to the Bruins in Boston on December 16th. Three nights later, rookie goaltender Matt Murray made his NHL debut against the Carolina Hurricanes. Murray made 24 saves in the 2-1 loss and was named the game's number three star. He made three more starts for the Penguins in late December and was sent back down to Wilkes-Barre/Scranton with a 2-1-1 record, 1.72 goals-against-average and .938 save percentage. ​Beginning on December 31st, the Penguins went 8-2-3 (.731) 22/and acquired Carl Hagelin from the Anaheim Ducks on January 16th in exchange for David Perron and Adam Clendening. Hagelin had scored just four goals in 42 games with Anaheim, but his speed against the Penguins in the 2015 Stanley Cup Playoffs while playing for the Rangers had made an impression. Sidney Crosby scored an incredible 18 goals in 19 games from December 26th to February 8th and scored a goal in each of the final seven games of that stretch which included 10 goals and six assists. After Sullivan took over, the Penguins were 18-2-2 (.864) when Crosby scored a goal and the Captain racked up 66 points (30G, 36A) in 52 regular season games under the new coach. The Penguins turned the tables on the Rangers from the previous year and ousted them in five games chasing New York goalie Henrik Lundqvist in Games 1, 4 and 5. Lundqvist finished the series with a 4.39 goals-against-average and .867 save percentage. Jeff Zatkoff won Game 1 and lost Game 2 in the series' first two games in net for Pittsburgh while Matt Murray recovered from a concussion suffered in the final game of the regular season at Philadelphia. In the second round, the Washington Capitals won Game 1 in overtime before the Penguins rattled off three straight victories including a 3-2 overtime win in Game 4. Washington won Game 5 at home and moved the series back to Pittsburgh for Game 6. Despite blowing a 3-0 lead when John Carlson scored a power-play goal with 6:59 left in the game after the Penguins took three consecutive delay of game penalties in a 2:02 span mid-way through the third period. Nick Bonino sealed the Capitals' fate 6:32 into overtime when he slipped in a backhand shot at the top of the crease to the right of Washington goalie Braden Holtby. ​In the Eastern Conference Final, the Tampa Bay Lightning stole home ice winning Game 1 in Pittsburgh, 3-1. The Penguins won the next two games on back-to-back game-winning goals by Sidney Crosby including his overtime winner in Game 2. The Lightning evened the series at 2-2 in Tampa before heading back to Pittsburgh for Game 5 where Sullivan started Marc-Andre Fleury, who hadn't started a game since March 31st. Tyler Johnson scored 53 seconds into overtime of Game 5 to put the Penguins on the brink of elimination. Crosby again netted the game-winning goal in Game 6 and the Penguins won 5-2 to bring the series back to Pittsburgh for the deciding Game 7. Unlikely hero Bryan Rust scored twice in the second period of Game 7 and the Penguins held on to eliminate the Lightning and advance to the fifth Stanley Cup Final in franchise history and third in nine years. 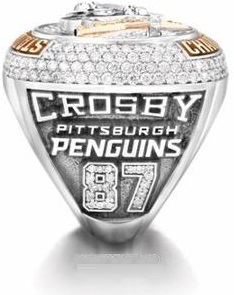 This ring is a replica of the actual ring awarded to Sidney Crosby. 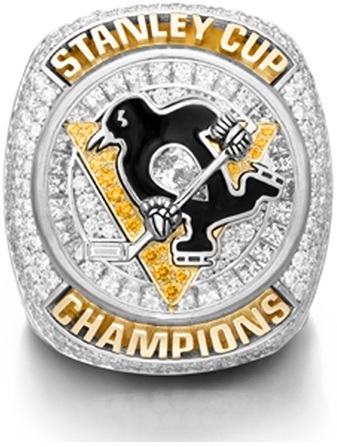 This size 11 ring features a raised skating penguin logo decorated with glittering cubic zirconia inside the penguins' chest and gold triangle of the logo surrounded by a circular band of beautiful stones. 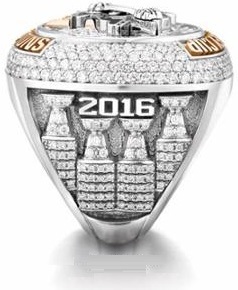 Dozens of additional stones outline the shoulders of the ring containing "Stanley Cup Champions" raised in gold above and below the skating penguin logo. The right shank features Crosby's name above the Penguins' script logo and his number "87" clad with shining stones. The right shank features four stone-clad Stanley Cup trophies with "2016" proudly displayed at the top. On the inner band, the words "JUST PLAY" - the team's simple mantra after Sullivan took over - along with the logos and scores from each Playoff series are engraved meticulously.